The 15th Japanese Speech Contest for Foreigners in Kagoshima. 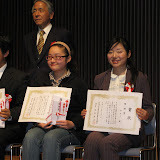 5 students entry in the contest from Kyushu Japanese Language School and one of them Ma-san got a prize! Congratulations! SAKURAJIMA was very beautiful on that day.